Coasteering is one of the fastest growing outdoor adventures and is the perfect way to explore Britain’s rugged coastlines. Combining the excitement of swimming, climbing and cliff jumping, hardy adventurers negotiate their way across coastal landscapes, canyons and gorges, braving chilly water, exhilarating heights and demanding scrambles up rockfaces or through caves along the way. 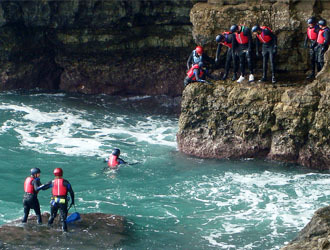 The varied seaside scenery of the UK’s best beauty spots means there is no shortage of destinations to get stuck into the varied challenge of coasteering, with ancient rock formations, challenging cliff trails, daredevil plunge pools and rolling waves all offering their own unique tests. Pembrokeshire is the most popular seaside destination in Wales and offers attractions galore, including its Blue Flag beaches, unique wildlife and beautiful national park. Walkers and wildlife-lovers flock to the dramatic coastal path but to enjoy it with an added thrill, don a wetsuit and helmet and traverse the rocky route in adventurous style with a host of guided coasteering routes available to enjoy. 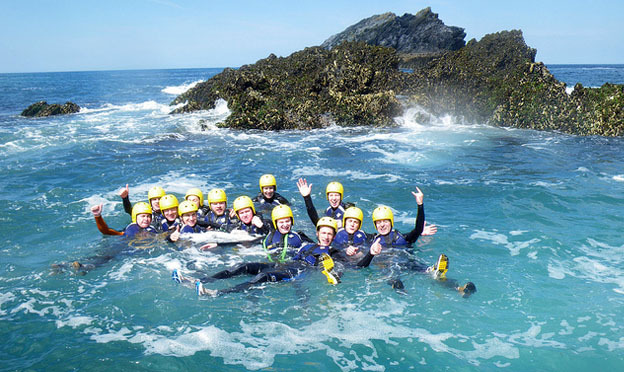 Long established as the UK’s surfing capital, coasteering provides a new way to enjoy the stunning southern beach resort of Newquay, which attracts adrenalin-junkies and fun-loving groups from up and down the country and beyond. Freshwater coasteering is available inside the spectacular Adrenalin Quarry, or you can take on the Celtic Sea off the Cornish coast with daring 35ft cliff jumps and ocean cave climbs. If you like to combine your coasteering adventure with exploring 185 million years of the earth’s history, then head to England’s first natural World Heritage Site, the 95-mile long Jurassic Coast. Your swimming, climbing and jumping pursuits will take you through mysterious caves, across unspoiled cliffs and fossil-filled beaches and into exhilarating plunge pools. Coastlines don’t get more dramatic than in Scotland and the Land of the Brave makes the perfect destination for your adrenalin-filled experience days. Organised coasteering trips will see you appropriately kitted out for the chilly Atlantic Ocean, with the craggy coasts of the west of Scotland perfect for the thrills and spills of coasteering. Newcastle in County Down boasts tempting surf for watersports enthusiasts and is working hard to establish itself as the unofficial activity capital for Northern Ireland. Coasteering is now among the latest must-do attractions in the area, with plenty of nooks and crannies waiting to be explored as you clamber in and out of the Irish Sea. It looks like UK has a lot of beautiful places to visit. The pictures on your website are absolutely breathtaking! Thanks a lot for sharing!